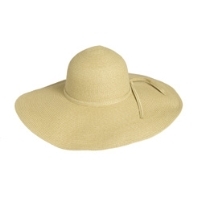 Bring out your inner 70's feminine charm with this straw, large brimmed (6") hat. Don't worry about the brim's shape: there's a plastic wire built-in to hold the perfect silhouette. One size fits most.